Tea Is For Turtle: What's That Smatter? Whilst trekking home after standing in as a bingo caller at his local bingo hall, Turtle heard a strange smattering noise coming from not so far away. Turtle had been warned before that this route home was not the safest and so started to become somewhat concerned. But, not being one to run from spooky noises (or more likely walk as briskly as possible) Turtle continued on through the dim light of his path. It wasn't long before Turtle turned a corner and there before him was gathered a tiny troop of oddly adorned dogs. Now, Turtle had seen plenty of doggy outfits before; but none quite like this. On each paw was some kind of flipper, on each muzzle an orange bill, and on every pooch's back hung a cape with the words "delinquent ducks" impressed upon it. What all this meant, Turtle couldn't be sure; but frankly, all that smattering was beginning to get on his nerves. So, on Turtle wandered, pondering these duck-dogs for only a moment or two. After all, there are much greater concerns for a thirsty tortoise to think of. See that Jack! Dog Jacket from Crochety Craft. The Pookie - Hand Stamped Pet ID Tag from Very Vintage. 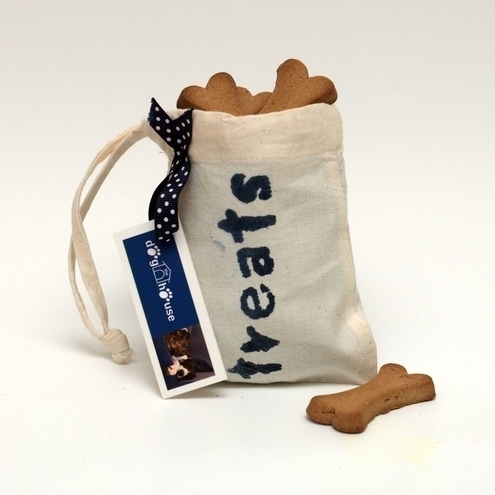 Pet Treats Pouch from Max and Molly Designs. This would be Turtle's favourite shop if he were a dog.